Faculty and staff wishing to have their computer backed up to the SJMC backup server should contact Sterling. Once you are set up on the backup server you can view backed up files, and the status of your backup by going to the following website: http://localhost:8000/workstation. This is a link to the web interface of the backup software on your computer, it will only work from the computer you are backing up. If prompted to log in use the same user name and password you use to log in to your computer. You should see something like the image below. Click Test to ensure you are connecting to the server, you should see a message stating you successfully connected to the server. After that, click Start to begin a backup. There should be a progress bar and some text similar to below once the backup starts. 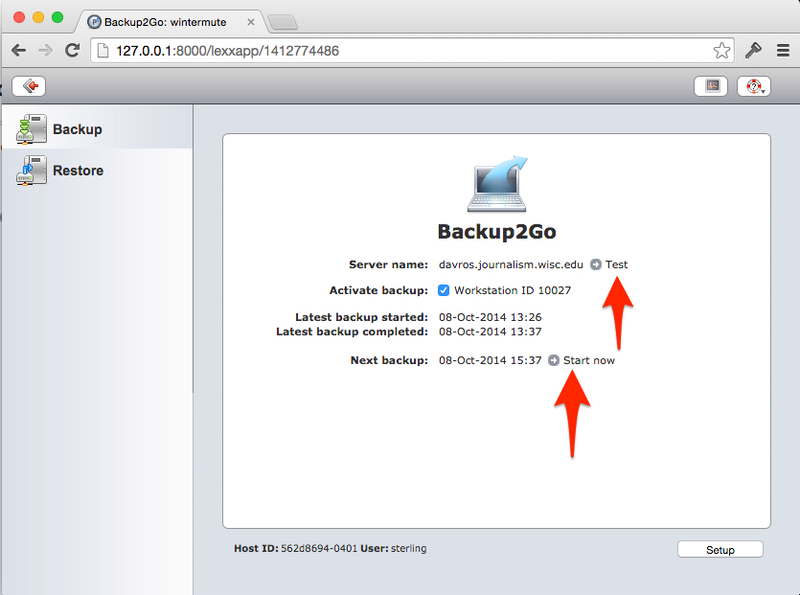 It is not necessary to follow these steps every time you want a backup. The backup continues to run continuously in the background, as long as you are connected to the internet. Any questions or problems please schedule a time to meet with Sterling.